Haku Haku, Our Squaxin Cousins have invited us to paddle with them again this year. It will be a 3 day pull from Seattle to Olympia about 80 miles, Squaxin has a small grant for us and we need to make our give a ways and be in Seattle on July 22nd arrive in Squaxin Island the 29th for 5 days of ceremony and Fun. We need to write grants and donations and go paddle with our cousins from Alaska, Canada, Washington, Oregon, California, Hawaii, Japan. On July 29, 2012, The Squaxin Island Tribe will host the 24th annual Canoe Journey, an intertribal celebration of Pacific Northwest canoe culture and tradition. More than 100 canoes will land at the Port of Olympia, in Washington state, with thousands of people joining together to welcome each arrival. For centuries, Pacific Northwest tribal people navigated the waterways in intricately carved dugout canoes. The Salish Sea, the body of water that encompasses Puget Sound, the Strait of Juan de Fuca and the Strait of Georgia in Canada, was the central force that connected canoe cultures for intertribal communication and trade. But early federal government mandates outlawed many tribal traditions, resulting in the almost lost art of canoe building, and ceremonial practices. In 1989, the Canoe Journey event, originally called the “Paddle to Seattle”, was organized as a revival of the canoe culture traditions and the Native American contribution to the Washington State Centennial. Today, tribes from Washington, Oregon, Hawaii, Canada, New Zealand, Japan and the Seminole Tribe in Florida participate. The Bella Bella, from British Columbia, will travel more than 1,000 miles over 23 days. As the canoes arrive at the host site on July 29th, each canoe family asks for permission to come ashore, according to their own culture and protocol. Paddles are raised, signifying “We come in peace.” The Squaxin Island Tribe will then host a week of traditional potlatch ceremonies and festivities with daily performances by dancers, singers and storytellers. 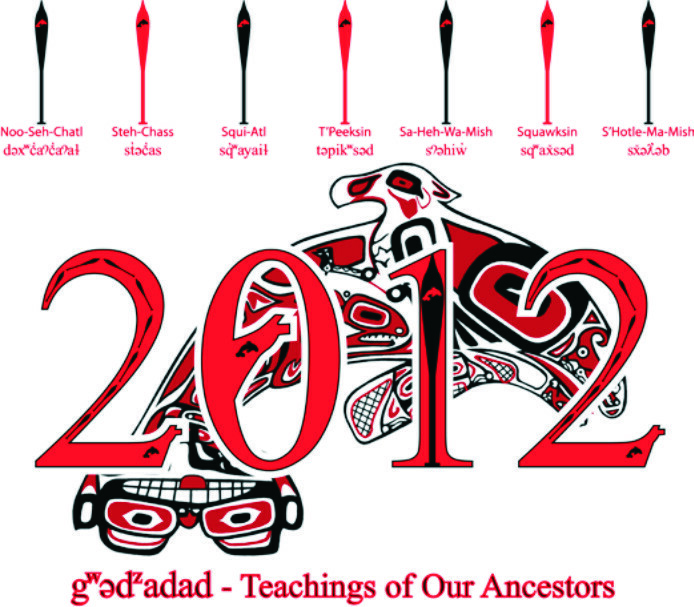 Potlatch ceremonies and performances will take place on the Squaxin Island Reservation. The public is welcome but is asked to respect ceremonies, while in the protocol tent. The Tribe is currently working in partnership with the City of Olympia and the Port of Olympia on a transportation and parking plan to accommodate visitors and participants. For additional information about activities in the surrounding Olympia and Thurston County area, visit the visitolympia.com, Olympia | Lacey | Tumwater Convention Bureau website , or call Toll-free: 1-877-704-7500; or (360) 704-7544.